Gastrointestinal health is critical for maintaining whole-body wellbeing. Imbalances in the gut microbiota living synergistically in the human gastrointestinal tract have been linked to many age-related chronic diseases including diarrhea, constipation, diabetes, obesity, metabolic syndrome, mood disorders, inflammation, allergies, irritable bowel syndrome, colon cancer, neurodegeneration and many more. Microbiome Plus+TM is an innovative new line of products that provide more complete dietary support for gastrointestinal and whole body health. All Microbiome Plus+ products and their components have been verified by doctors and optimized to treat specific physiological ailments. 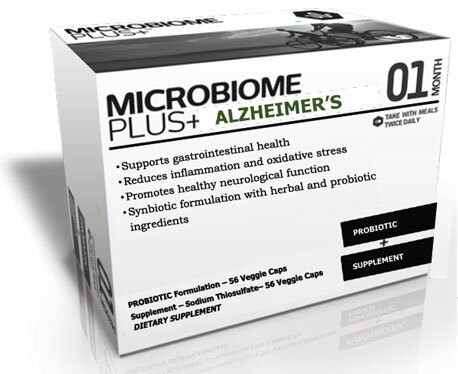 WHAT IS MICROBIOME PLUS+ ALZHEIMER’S? WHY RECOMMEND MICROBIOME PLUS ALZHEIMER’S? Microbiome PLUS+ Alzheimer’s is a unique formulation containing the ferulic acid esteraseactive probiotic Lactobacillus fermentum PV6910 (Lf6910) together with the inorganic chemical compound sodium thiosulfate (STS). The guthealth promoting action of Lf6910 together with the neuronal anti-inflammatory action of STS makes this synergistic product a superior preventative support for Alzheimer’s disease and other age-related cognitive decline. Many studies have shown that reinstating gastrointestinal homeostasis with dietary modifications, including probiotics and other plant-derived dietary supplements is highly beneficial at maintaining a youthful glow. Oxidative stress, chronic inflammation, metabolic imbalances, insulin resistance and mental fatigue are just a few of the symptoms of aging that can be prevented, reversed and healed with probiotics and carefully selected herbal preparations. MICROBIOME PLUS ALZHEIMER’S, combines gut-healing actions of probiotics with the neuroinflammatory reducing potential of sodium thiosulfate – a generic drug with innovative potential against neuroinflammation.